I have been so busy using and reviewing spring collections that many of my favourite products have yet to be reviewed. I purchased Tom Ford’s Cognac Sable at the end of last year. It has become one of my most treasured and used palettes. At first site one might think too warm and too much glitter. Take a second look, you will not be disappointed My interest was first piqued when I watched Charlotte Tilbury work her magic with the Cognac Sable quad. 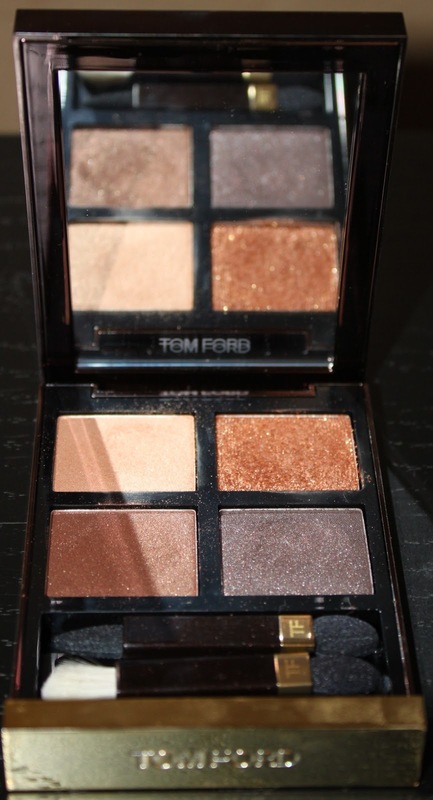 This was, together with Golden Mink (reviewed here) , my first Tom Ford eyeshadow quads. Down the rabbit hole, never to be seen again! The Tom Ford packaging is elegant and compliment these particular colours perfectly. The colours are a clever mix that can transition from day to night. The top left shade is a soft honey that brings brightness to the eye. This shade is good for blending out the other darker shades. The top right shade is a sparkling ginger that is gorgeous! This warm glitter is best pressed on with fingers in a patting motion. This unique shade brings out the caramel tones in my eyes that I never new I had. Just superb! Hero shade in my opinion. The two lower colours are a :- rich golden brown with the same fire orange tones as the ginger and a :- deep shade that is a rich smokey dark chocolate. This shade is so nice to line the eye, deepen the outer V, used on the whole lid and blended with the honey shade through the crease. All 3 non glitter shades work well for a day look. I use the glitter in the day too, but those with a more formal lifestyle, this should be reserved for going out. These colour stay put all day, on my oily lids with primer. No fading. They can be applied strong or sheered out. The texture of the shadows are silky and smooth. These highly pigmented shades are so blendable, even novices could master this quad. So beautiful and bold, they go on like velvet. If you looking for an unusual quad with very usable shades this is a quad worth looking at. Pair this quad with the TF eye definer in Espresso. Tip: Go Bold and wear this with a red lip- it is gorgeous. My pick is Tom Ford Narcotic Rouge. I am already searching the net for the summer Tom Ford collection. Nothing yet, but it is definitely on my hit list for summer 2013. Meanwhile, I am loving my Cognac Sable. Do you have a favourite palette that can do no wrong? Time to march down to the store and swatch these babies! I always used to shy away from too warm shades as I thought it made my overall look too 'orange', but this quad is special. I think the cool dark brown does a not job keeping the quad from going too orange. I love this one! Beautiful swatches, Jo! Thank you! – let's just say – Me and Cognac Sable are a match made in heaven! Previous Previous post: Rouge Bunny Rouge Loose Glitter Pigments – *like* Fairy kisses across your lids.